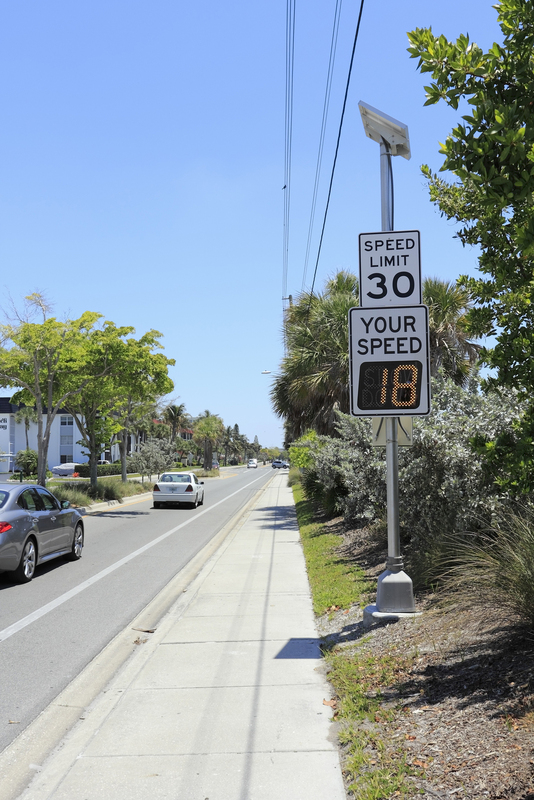 Byron H. asks: When exactly does a speed limit come into effect? Is it when you see the sign or the instant you cross it? If it’s an increase in speed can you legally accelerate up to the speed so your speed matches the sign right when you get to it, or do you have to wait? On paper, speed limits sound like a pretty simple idea- legislators and experts agree upon a given speed at which it’s deemed safe to travel through an area and then let the public know by clearly signposting it. But a question we’ve received numerous times over the years is when exactly does a speed limit legally come into effect? Here now is the answer. Any signposted speed limit comes into effect at the exact point the sign resides. In other words, if you’re driving at 30 MPH through a 30 MPH zone and you’re about to enter a zone that allows you to drive at 50MPH, it is technically illegal to begin accelerating beyond 30 MPH until you’ve reached the sign indicating the higher speed limit. Contrary to what people may try to tell you, by the letter of the law there is no “buffer” or grace period near a speed limit sign, which is why you’ll notice that when the speed decreases drastically, you may see a helpful warning sign telling you this before the actual speed limit sign so you’re not having to suddenly slam on the brakes to get down to the posted limit before you reach the sign. While it is certainly true that a police officer pulling you over in such a “buffer” scenario could be lenient and decide to just let you off with a warning, that’s entirely down to their own discretion and it doesn’t change that legally you’ve broken the law. This is true in the US, Canada and the UK, with all of the documentation we consulted saying the same basic thing- that a new speed limit zone begins at the exact point a sign is placed. What does vary between these countries, however, are the tolerances we allow in cases involving speeding. In the UK, we have something colloquially known as “the 10% rule” which states that you can generally get away with exceeding the signposted speed limit by about 10%. Again though, this is entirely down to the discretion of the police and it’s noted that technically “exceeding a speed limit by any amount whatsoever is an absolute offence”. However, official guidelines state that an officer can choose to take no action, or simply give a stern warning, if a person only exceeds the speed limit within the bounds of 10% plus an additional 2 MPH, after which they are by the letter of the law required to take action regardless of how good a mood the officer is in, the severity of which depends on a combination of their own discretion and how much the individual was speeding by. Speed measurements at the selected road segments shall be used to determine the top 5 percent of speeds. This information will be used to establish the enforcement threshold. The enforcement threshold should never be less than 5 mph above the new posted speed limit. This top-down strategy will not overwhelm the law enforcement officers, the prosecutors, or the courts. This strategy promotes public and court acceptance of enforcement by targeting only the most egregious violators. The overall goal of the enforcement efforts is motorist compliance, not issuance of citations. This unofficial buffer in speed is a good thing because, wherever you’re driving, your car’s speedometer likely isn’t perfectly accurate, even if you’re just driving it off the lot brand new with properly inflated stock tires. With many cars, particularly in the EU, your speedometer will actually be indicating you’re going faster than you are. This is because by law in the EU (ECE-R39) the speedometer can never show speeds less than the speed you are really traveling. To account for tires wearing down, temperature and pressure variation, varying loads in the vehicle and the like, manufacturers tend to err on the side of indicating you’re going faster than you are, but, also by law, must not fudge the numbers more than an additional 10% + 4 km/hr. According to Transport Canada, there are no such official regulations at the federal level in North America, though they aren’t wholly correct in that the U.S. does have federal standards concerning commercial vehicles, not to be off by more than 5 mph at a 50 mph reading on the speedometer. The manufacturers in this case will calibrate the speedometer to the stock tires with new tread and properly inflated. As the tire changes size for various reasons, the speedometer will be slightly off, with variations generally within the range of plus or minus 10%, though if you choose to buy replacement tires with a different size than the factory tires, your speedometer may be off by even more, making the unofficial speed buffer given by police particularly useful. As for the argument about whether or or not speed limits work in various scenarios and how the values are set, that’s a can of worms we’ll save for another article. So we’ll instead end by throwing some interesting counter-intuitive road related factoids at you. For starters, one of the most popular speed controlling inventions of all, speed bumps, kills numerous people every year by slowing emergency vehicles, according to the Chairman of the London Ambulance Service, Sigurd Reinton. This is a notion backed up by a study in Boulder, Colorado that indicated that for every life saved by various traffic slowing measures like speed bumps, an astounding 85 people die because of this slowing effect on emergency vehicles whether inherently, like in speed bumps, or by jamming up traffic. In addition to that, according to research done on the roads of New Zealand, the common zebra striped crosswalk, without any additional signaling, actually increases the chances of pedestrians getting hit by a car by 28% over if the person had just jaywalked. It is thought this is the case because pedestrians crossing in crosswalks are much less careful than those crossing the road elsewhere, even to the point that many people observed in the study didn’t bother to look if anyone was coming before entering a crosswalk. Another study done in the United States on over a thousand marked and unmarked popular crossing areas also showed that marked locations had a much higher rate of pedestrian accidents than unmarked so long as there weren’t any other signals included with the crosswalk, such as a stop sign/light or flashing lights. They also found that including a raised “safety” median for pedestrians to stand in the middle of roads made no difference to the safety of the pedestrians regardless of the number of lanes on the road. On a similar note, most road hazard signs have been shown to be worthless in terms of decreasing accidents, though there are rare exceptions. While exceedingly rare, there are some places in the world where the speed limit isn’t a multiple of 5, for example there are several parking lots around in America where the posted speed limit is 4 or 8 MPH. There is a scientifically guaranteed way to reduce any fines you may receive for speeding- saying sorry. According to this study on “the value of remorse”, the simple act of saying “I’m sorry” or just admitting to the officer what you did, overwhelmingly results in lower fines and more leniency from an arresting officer. Of course, this won’t work if you’re driving 100 MPH in a school zone, but in most minor cases it couldn’t hurt your chances to at least try. Of course, the downside to this is that you’re then on record as admitting to speeding or some other traffic violation, limiting your options if you should choose to fight a ticket. But if the officer pulled you over and is planning on giving you a ticket, odds are they already have the evidence they need, with rare exceptions. The value of remorse: how drivers’ responses to police predict fines for speeding. Speedos display higher rates of speed to shorten your warranty time. Despite huge bright fluoro green signs warning of peds, nobody has stopped for me ever in the crosswalk in the parking lot where I work. In Victoria, Australia a vehicle’s speedometer can be out by 10 percent plus 4 km/h of true speed. However, the tolerance for speeding fines is 3kph over the limit, thus on a 100kph road one may be fined for travelling at 104kph although the speedo may in fact read 96kph. Revenue raising and highway robbery all rolled into one, literally. I ask the question, How far dose a police person have to be from a reduce speed sign 30mph, if he is monitoring the vehicles speeds. I was picked up today and i asked how far was i from the speed limit sign when the police person logged me at over the 30mph limit. I was told 40mtrs. That in the old money is oround 55 yards. That to me is a very short distance to be able to slow down from a 70mph zone to a 30mph. Let’s say you are getting off a freeway with a speed limit of 65 mph, are you allowed to continue to go 65 mph on the off ramp, onto the side road, until a lower speed limit sign is posted? Even though the side road’s speed limit is 45, but you haven’t seen it yet because you just got off the freeway. I have never seen an exit ramp with a speed limit. If a sign is not black on white (or the reverse) and rectangular, it is not a legally binding speed limit. The yellow signs beneath curves are suggestions, not a speed limit. The big, yellow “Ramp/Exit 25 MPH” signs at the start of off ramps are suggestions, not a speed limit. Since states tend to have general prevailing speed limits for different kinds of roadways, and drivers are expected to know those speed limits, I don’t think you could transition from a freeway or interstate onto a lesser road without reducing your speed. For this reasons, speed limit reductions are usually well marked, in my experience. But I am no lawyer. Only the BIG signs cost $10,000+ to install. And by “big signs” I mean the big green signs (or whatever color is needed) found along and over freeways and interstates. It does not cost $10,000 to install a common Stop sign. A regular road sign should cost between $100 and $500 to create or procure and install.